In the seventh round at the 75th Tata Steel Chess 2013, the 2010 Tata Steel winner had a difficult pairing on paper, facing his nemesis Wang Hao with Black. 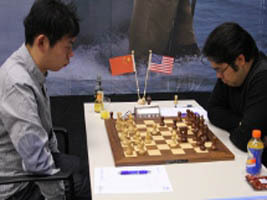 Wang Hao was on plus 4 after just 7 games with Nakamura. However, the past was soon forgotten when the Chinese Grandmaster made a few errors in the opening, allowing the American Grandmaster to seize the initiative. Nakamura won an exchange and had no difficulties with the technical phase. Review the game with Chess King, watch the post-game comment and read a report on Round 7 at Chess Blog.